The oldest bar in San Francisco, The Saloon first opened in 1861, and has been in continuous operation ever since. The building looks very much the same as it does in photographs from the 1870s. The elaborate wooden bar which is currently in use was installed in the 1860s, and was constructed outside of America and later shipped to San Francisco. 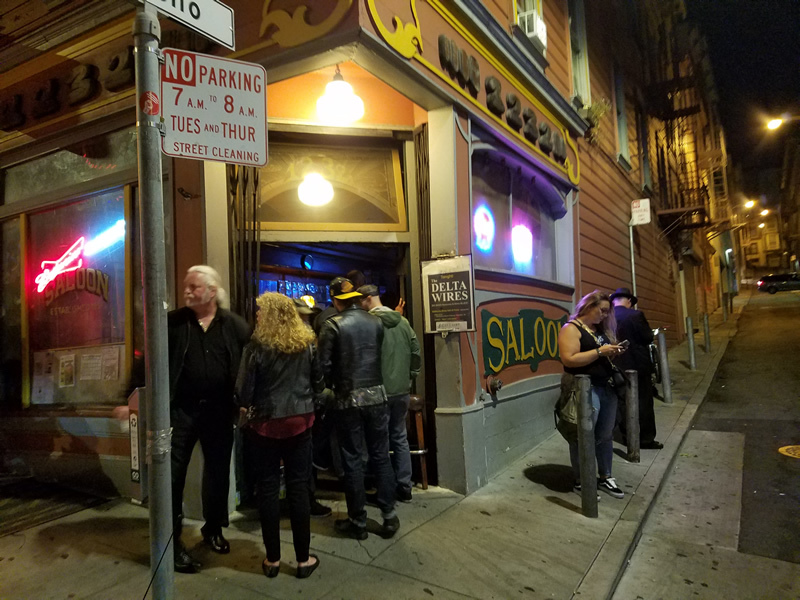 The Saloon is located in the North Beach neighborhood of San Francisco, although in the 1860s its location occurred near the northern border of the Barbary Coast district. During that time the Barbary Coast had scores of dance halls and concert saloons. In 1906 San Francisco experienced a devastating earthquake and subsequent fire which destroyed most of the buildings in the area. Legend has it that a U.S. Navy frigate which was stationed on the northern waterfront extended a fire hose over Telegraph Hill and pumped water from the bay to fight the flames, thus protecting The Saloon. In the late 1960s and 1970s Grant Street had numerous blues clubs like The Saloon, which supplied live bands playing music every night. Though many of those blues clubs have disappeared, The Saloon continues to provide a dance floor and daily performances by locally acclaimed musicians. Despite its small size, throughout time The Saloon has attracted the performances of many talented and occasionally famous musicians. DELTA WIRES performs at the Saloon about one a month.